Visual Astronomy: Some Great Sketches! I recently received some great crayon and pencil sketches of Saturn, Mars, and Jupiter from Paul Abel, a fellow amateur (and professional!) astronomer. Mr. Abel is part of the Physics & Astronomy department at the University of Leicester, UK. Below you can see some of his excellent sketches, which are great examples of planetary sketches! This sketch of Saturn was created using an 8" SkyWatcher Newtonian reflector. 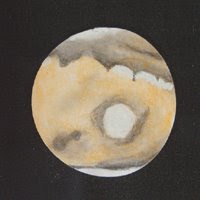 This sketch of Mars was done using a 12.5" reflector. 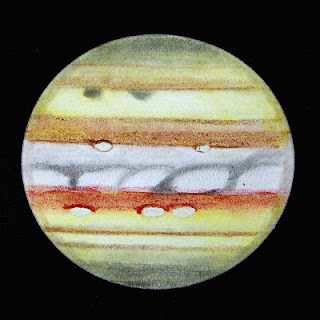 This sketch of Jupiter was created with the same 8" SkyWatcher Newtonian as the Saturn sketch. Sketches provided by Paul Abel. Whoa! This guy is a master! I wish I had those kinds of skills. Must have taken him hours each skecth. This approach is a really excellent and additionally revealing. Featuring all of the knowledge together with boasts an awesome effect on the latest solutions. At this time follow-up check cashing Thanks for nice work.